Institution in Breslau for the training of rabbis, founded under the will of Jonas Fränckel, and opened in 1854. Commercial Councilor ("Kommerzienrath") Jonas Fränckel, a descendant of a rabbinic family, and a very wealthy bachelor, who devoted his entire fortune to philanthropic and educational purposes, left a bequest for the establishment of a training-school for rabbis and Jewish teachers. Franckel was president of the Breslau congregation, and an enthusiastic supporter of Geiger, who had no doubt inspired the bequest; and it was probably the founder's intention that Geiger should be the president of the institution (Abraham Geiger, "Leben in Briefen," p. 129, Berlin, 1878). The executors of the Fränckel legacy felt, however, that an institution which should be presided over by a man of Geiger's advanced views would not gain the confidence of the congregations; they therefore called Zacharias Frankel to the presidency (Feb. 7, 1853). Owing to some legal complications the seminary could not be opened until Aug. 10, 1854, although its constitution had been confirmed by royal order of Aug. 31, 1847. Frankel selected as teachers Heinrich Graetz and Jacob Bernays, to whom Manuel Joël and B. Zuckermann were added as assistants, both being soon afterward promoted to the rank of regular teachers. 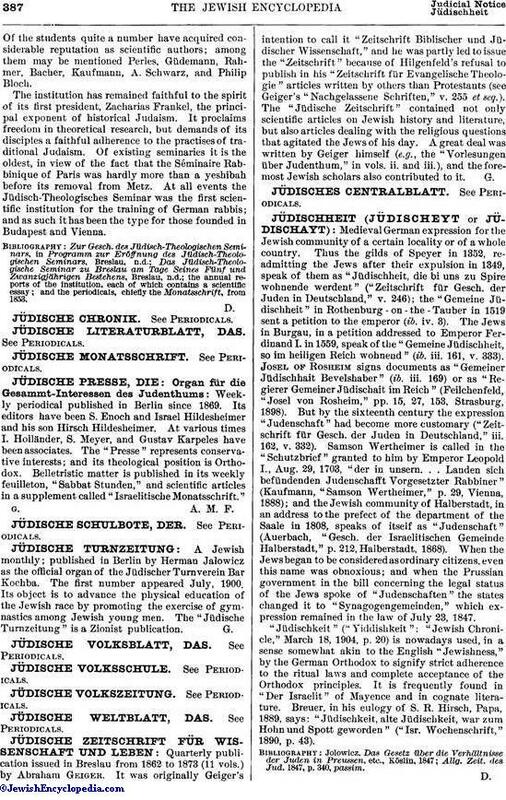 The institution had at the beginning three divisions, namely: the regular rabbinical department, which admitted only such students as were entitled to enter the university; the preparatory department, receiving students who possessed the knowledge required for entrance to the "Secunda" of a Prussian gymnasium; and a training-school for religious teachers. For a teacher's diploma a three-year course of study was required, while the rabbinical course required seven years. The teachers' seminary, which in the beginning was very well attended, soon declined, and in 1867 was closed on account of lack of students. The preparatory department, originally necessary because the students of the seminary came largely from yeshibot and had no secular training, became superfluous with the increase of students having regular gymnasium education, and was closed in 1887; so that to-day the seminary has only one department, and provides for theological training only. The administrators of the Fränckel estate inaugurated the seminary with a capital of 100,000 thalers ($72,000) apart from the building and the library; for a teachers' pension fund the sum of 3,000 thalers was set aside; and a stipendiary fund for students was started with 5,000 thalers. The last-named fund received many additions in later years, and special foundations were created for graduates who had not obtained positions, e.g., the Director Frankel Stiftung, founded on the occasion of Zacharias Frankel's seventieth birthday (1861), and a similar foundation on the occasion of Graetz's seventieth birthday (1887); two prizes, one founded by Joseph Lehmann (1855) with a capital of 1,800 marks, and one by David Kaufmann (1895), in memory of David Rosin, with a capital of 4,000 kronen. The subjects taught at the rabbinical seminary were: Talmudic literature, by the president ("Director"); history and exegesis, by Graetz; philosophy of religion, by Bernays; homiletics and Midrash, by Joël; and the calendar by Zuckermann, who was also librarian. This division was changed in details when the teaching staff underwent changes, but remained the same in its general principles. In 1863 Joël became rabbi of Breslau and was succeeded by Jacob Freudenthal, who retained his position at the seminary until 1888, when he was appointed professor of philosophy at Breslau University. In 1866 Bernays was called as professor of philosophy and chief librarian to the University of Bonn, and he was succeeded at the seminary by David Rosin, who held the post until his death (Dec. 31, 1894). After Zacharias Frankel's death (Feb. 13, 1875), Leyser Lazarus was elected president and served as such from Sept. 23, 1875, until his death (April 16, 1879). After Lazarus' death the administration changed. 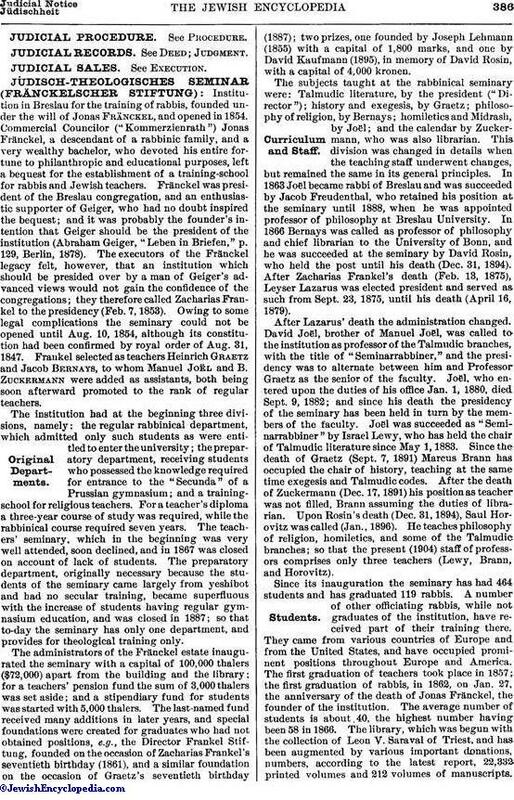 David Joël, brother of Manuel Joël, was called to the institution as professor of the Talmudic branches, with the title of "Seminarrabbiner," and the presidency was to alternate between him and Professor Graetz as the senior of the faculty. Joël, who entered upon the duties of his office Jan. 1, 1880, died Sept. 9, 1882; and since his death the presidency of the seminary has been held in turn by the members of the faculty. Joël was succeeded as "Seminarrabbiner" by Israel Lewy, who has held the chair of Talmudic literature since May 1, 1883. Since the death of Graetz (Sept. 7, 1891) Marcus Brann has occupied the chair of history, teaching at the same time exegesis and Talmudic codes. After the death of Zuckermann (Dec. 17, 1891) his position as teacher was not filled, Brann assuming the duties of librarian. Upon Rosin's death (Dec. 31, 1894), Saul Horovitz was called (Jan., 1896). He teaches philosophy of religion, homiletics, and some of the Talmudic branches; so that the present (1904) staff of professors comprises only three teachers (Lewy, Brann, and Horovitz). Since its inauguration the seminary has had 464 students and has graduated 119 rabbis. A number of other officiating rabbis, while not graduates of the institution, have received part of their training there. They came from various countries of Europe and from the United States, and have occupied prominent positions throughout Europe and America. The first graduation of teachers took place in 1857; the first graduation of rabbis, in 1862, on Jan. 27, the anniversary of the death of Jonas Fränckel, the founder of the institution. The average number of students is about 40, the highest number having been 58 in 1866. The library, which was begun with the collection of Leon V. Saraval of Triest, and has been augmented by various important donations, numbers, according to the latest report, 22,332 printed volumes and 212 volumes of manuscripts.Of the students quite a number have acquired considerable reputation as scientific authors; among them may be mentioned Perles, Güdemann, Rahmer, Bacher, Kaufmann, A. Sehwarz, and Philip Bloch. The institution has remained faithful to the spirit of its first president, Zacharias Frankel, the principal exponent of historical Judaism. It proclaims freedom in theoretical research, but demands of its disciples a faithful adherence to the practises of traditional Judaism. Of existing seminaries it is the oldest, in view of the fact that the Séminaire Rabbinique of Paris was hardly more than a yeshibah before its removal from Metz. At all events the Jüdisch-Theologisches Seminar was the first scientific institution for the training of German rabbis; and as such it has been the type for those founded in Budapest and Vienna. the annual reports of the institution, each of which contains a scientific essay; and the periodicals, chiefly the Monatsschrift, from 1853.